That's what this weekly feature is all about: we can all be weird friends! So we're going to watch (and discuss!) some of the best documentaries Netflix has to offer together. Think of it as a book club without books (which we know is just what you've been clamoring for!). 1. Mondays we announce the documentary of the week. 2. Fridays we discuss it in the comments. Simple, right? We'll have conversations ranging from contemplative to hilarious — and you should expect some surprise pop-ins by special guests involved in the making of each film. You're definitely going to want to talk about these documentaries, guys — they're so good. Documentaries about the fashion world have earned their rightful place in every documentary-lover's heart, and with good reason: they're sorta insane. Who are these people? What kind of alien, parallel universe do they inhabit? Do they even own sweatpants? 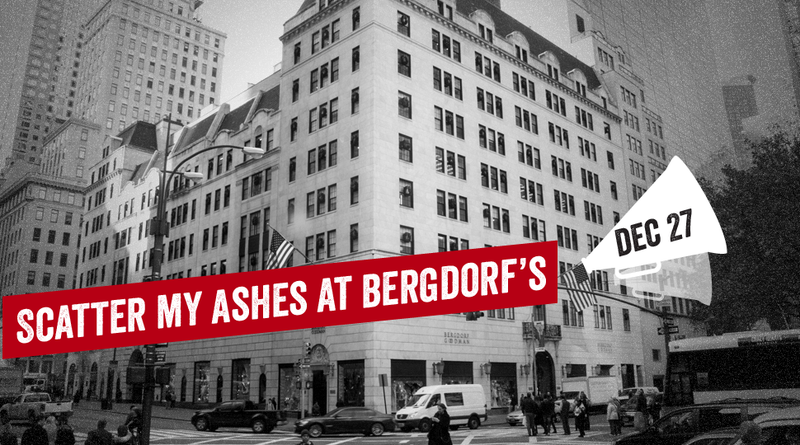 That tradition continues with Scatter My Ashes at Bergdorf's, a historical account and celebration of New York City's swankiest department store. While you may be aware of its iconic status among the elite, you might not be familiar with its origins, involvement in both the art and financial worlds, or, you know, just how much money personal shoppers make each year. (Actually, maybe you don't want to know that.) This documentary is, in a word, riveting. So get to watching! You have four days. Then we'll see you Friday for what promises to be a scintillating discussion. You can also head to netflix.kinja.com for more.